I am much looking forward to the rolling out of the Ordinariate Ordo Missae tomorrow, Saturday evening at 6, in the Church of the Holy Rood, on the left as you go just a liiiitle way down the Abingdon Road after crossing Folly Bridge, which is the bridge you get to in Oxford as you go from Carfax South past Christ Church (well, Cardinal College, really; they quite often have Wolsey's flag flying) and then the Police Station (which featured so interminably in the Inspector Morse series). An important thing about the Ordinariate Mass is this. It contains much loved elements of the Vetus Ordo Mass associated with the name of that great Saint, S Pius V. Praeparatio at the foot of the Altar; Last Gospel; and, most theologically significant, the proper, pre-Conciliar, Sacrificial, Offertory Prayers. And it combines these with elements, such as use of the vernacular, from the Novus Ordo. This makes it a pointer towards the reconnection of the Novus Mass with the tradition that went before it. And it points also towards what Benedict XVI hoped for: an eventual convergence of the two Ordines. Thus it is undoubtedly, together with Summorum Pontificum, one of the two most significant liturgical advances since 1969. Not just for former Anglicans, but for all Catholics with Tradition at heart. Query: is The New Liturgical Movement doing a series, or is it not, which will come to a conclusion, on whether the Roman Rite originally had three readings (including the OT) at most Masses? I'm a trifle puzzled. In Liturgy there often tend to be lots of funny little clues which point to elements which have got lost. I do not know of any such tasty little clues to support the hypothesis of the Lost OT Reading*. I suspect that, quite simply, at some early point somebody/bodies in Rome decided that it would be NT nearly always on Sundays/festivals, with OT on fasting ferias/vigils etc., and in the Divine Office. (Such a system, of course, would be expected to become gradually eroded and 'exceptions' would enter the rite; Masses of our Lady spring to mind.) Substantially, this is very much what we still have now, and very neat it is. And it supplies a very Rich Table of OT Scripture. I think the way forward might be the re-examination of Patristic remarks about Scripture to see whether there is any evidence of a rationale being offered for such a practice. The reason why this has never been done is that nearly everybody has blindly accepted the unevidenced theory of the Missing OT Reading at Rome. I would be interested if my erudite readership had any ideas. *Except, just possibly, the presence of two psalms after the Epistle. But this would point to the 'missing' reading having come between the Epistle and the Gospel. He didn't want to use the word novus. He didn't want to perpetuate the idea, common both to its friends and its enemies, that the Pauline Missal was "new". He would rather it had been promulgated explicitly as within the tradition of the evolving Missals since 1570, rather than as a new liturgical start bestowed upon the Church by the New Pentecost of 1964. Novus/Vetus seemed to him to express a Hermeneutic of Rupture. I suppose a common analysis of what happened in the 1960s might be: The Council mandated a fairly light revision of the Liturgy; however, particular interests subsequently gained control of the levers of liturgical power and pressed things to extremes. I suggest that something really quite different happened, realisation of which might have its embarrassments both for Trendies and Traddies. "When the Easter Vigil had been restored, a certain keen liturgist did not hesitate to assert: Pope Pius XII, in the history of Liturgy through the ages, will be 'The Restorer of the Easter Vigil'. Now, indeed, by the help of God's grace he is to be called 'The Restorer of Holy Week'; while in the secret of our hearts we do not doubt that still greater things await this indefatigable Labourer, and it is very likely (nec veritatis specie caret) that He will be 'The Restorer of the entire Sacred Liturgy'". Remember, also, the extremely radical nature of the 'restored' Holy Week. I venture to say that it is, if anything, more radical than the post-Conciliar changes to the Ordo Missae itself. 1951 and 1955 were simply two stages of which 1969 was the logically coherent third stage. The changes to Holy Week were only less radical than the later changes in that they affected merely one week of the year ... and services which were not of obligation ... and services which, in fact, for the most part, comparatively few people attended. Now let me bring in Cardinal Ratzinger's famous words of 1999: "After the Second Vatican Council, the impression arose that the pope really could do anything in liturgical matters, especially if he were acting on the mandate of an ecumenical council. ... In fact, the First Vatican Council had in no way defined the pope as an absolute monarch. On the contrary, it presented him as the guarantor of obedience to the revealed Word. The pope's authority is bound to the Tradition of faith, and that also applies to the Liturgy. It is not manufactured by the authorities. Even the pope can only be a humble servant of its lawful development and abiding integrity and identity"*. I think these are admirable sentiments. My only qualification would be is this: Pius XII had initiated the process of radical alteration, using the same people who were to be prominent after the Council, such as Annibale Bugnini, before and without the mandate of an ecumenical Council. We had come a long way since that admirable and erudite Pontiff Benedict XIV concluded that the disposition of the Psalter in the Roman Breviary could not be changed because there was no evidence that the Roman Church had ever used a different one. I suggest the Twentieth Century liturgical changes would most appropriately be called the Pian-Pauline Reforms. They are changes based on exactly that notion of papal power which Benedict XVI so acutely criticises: that the Pope can do anything. The process of liturgical 'reform' has, from the beginning, been the product of the maximalising Papacy of Pius XII. The 'Council' has only been an episode in that process. I never ceased to be amazed by this central paradox of mid-twentieth century Catholic history: that the 'Progressives' and 'Liberals'were able to transform the Latin Church pretty well overnight by manipulating an absolutist model of Papal power. I think it will be very interesting to see, over the medium term, how Pope Francis understands his Ministry. It can be easy for a good man with admirable motives and who is facing real problems to use the power which his position gives him to take short cuts. It takes a very learned and a very truly humble Pontiff - such as a Benedict XIV or a Benedict XVI - to understand, and to internalise his perception of, what he ought not to do (and I'm not only talking about Liturgy). Pope Francis's two recent utterances which bear upon the Hermeneutic of Continuity make me cautiously optimistic. If this man can consolidate the gains made by our beloved Pope Benedict XVI and at the same time prudently develop the teaching of the Magisterium about the Preferential Option for the Poor, he could turn out to be a great Pontiff. *Fr Aidan Nichols reports that Fr Adrian Fortescue, nearly a century ago, wrote "The Pope is not an irresponsible tyrant who can do anything with the Church that he likes. He is bound on every side ..."
Ahhh ... did I mention the council of Trent? Interesting to read the recent (Rorate) document on Trent by our Holy Father Pope Francis. It would be splendid if the English Bishops were to follow his lead in encouraging recommitment to the Magisterium of Trent. *AKA Christopher Davenport, who was an undergraduate at the antecedent of my own college at Oxford and was reconciled to full communion with See of Peter by a priest working probably out of the Recusant centre at Waterperry near Oxford; had a distinguished academic career; was chaplain to Queens Henrietta Maria and Catharine of Braganza; reconciled the first wife of James II to Full Communion. He was acquuainted with the martyred Archbishop Laud and with Richard Montagu, the Anglo-Papalist Bishop of Chichester and Norwich. Deserves to be better known. His brother, a puritan minister, ended up in Connecticut (is that somewhere in North America?) ... a counter-cultural family? A week or so ago I was writing a sermon, and I again discovered, as one so often does, the extent of my own ignorance. The Coronation Service. The Orb ... the round golden ball surmounted by a cross, symbolising the Sovereignty over all the world, all peoples and nations and potentates, of Christ the King. I discovered that it seems not to feature in the medieval English Liber Regalis, laying down the procedures for consecrating English Monarchs. Or in the Pontificale Romanum. I don't think an orb was included in the Scottish regalia (so much more ancient and beautiful than the English, incidentally). I don't recall seeing it in those magnificent pictures of Bourbon monarchs, down to Charles X, in their Coronation robes. Wikipedia does reveal its existence in the Byzantine and Holy Roman Empires. I believe the Orb was listed in Tudor inventories. All of the above assertions are not properly checked and may be erroneous. I wonder: could it be that the Orb was seen as having some connection with notions of Empire and that it was introduced into England in the context of Tudor imperial ambitions? Somebody out there must know! If you have some Latin but not a lot, beware of the adjective Vetus. It doesn't 'go' like novus/nova/novum. It's Thirdish. Not vetus/veta/vetum but ... well, you'll find it in your grammar book. In that August interview which our Holy Father Pope Francis gave to a Fr Spadaro, there was an interesting pair of terminological innovations. 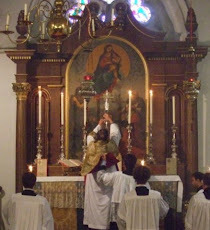 Firstly: the Extraordinary Form of the Mass was referred to as the Vetus Ordo. This, surely, is very useful and in my view most welcome. The word Extraordinary is often currently misunderstood. Words do change meaning; take, as a random example, the word forensic. It means 'concerning the law courts'. But because it has so often been used in the phrase forensic Science, the ellipse of the word Science means that forensic on its own it has for many people come to mean 'scientific'. (I expect philologists have a technical term for this sort of shift.) Likewise, the commonest ecclesiastical application of the word extraordinary is in the phrase extraordinary ministers of Holy Communion, and so inevitably extraordinary has for many people come to mean 'You get them absolutely everywhere'. This is quite simply not as yet true of the 'Extraordinary Form' of the Mass. Vetus Ordo, on the other hand, is purely factual, purely descriptive, and, with its pair Novus Ordo, is entirely, and happily, free of value judgements. Pope Francis wished simply to get the ideology out of the 'Liturgy Wars'; and this is absolutely right. There is no place for ideology at the foot of the Altar of God. Or, for that matter, for wars. So, rather than asking "Was it an Eeee Efff Mass", we can now simply ask "Was it Vetus?" More succinct, more stylish. The second terminological innovation was the use of the word Sensibility. The Holy Father, in that interview, referred to "alcune persone che hanno questa particolare Sensibilita." And the usage was picked up and applied by the Nuncio to France in his recent letter to the FSSP in that country: "quelle que soit leur Sensibilite".Hence there are now two Sensibilities in the Latin Church: the Vetus and the Novus. So, at parties, as we balance our wine-glasses precariously on our cardboard buffet plates and stab with our cocktail sticks at the bits of cheese and pineapple, the new with-it conversation starter will be "What's your sensibility?" Did I say two Sensibilities? Rather, there are three. Don't forget the Sensibilita Anglicana. Should I be so cross? Well, it did make me rather tetchy. I read somewhere about some 'traditionalists' referring to celebrations of the Novus Ordo Mass as "evil". It made me more than 'rather' cross. BUT ... and it's a very large But ... however it is celebrated, the Mass is the Sacrifice of Christ our Lord and Redeemer, re-presented on Earth and before the Face of the Everlasting Father. By its inherent nature, it is a wonder before which the Angels fall down in worship and the Devils tremble. In it, the Lord of the ages runs to meet us, his outstretched arms marked with the wounds of his love. No valid celebration of Mass can be within a million miles of being 'evil'. No sin, no heresy, no liturgical messing about on the part of a daft celebrant, can change this by so much as a millimetre. Since I began to exercise sacerdotal ministry in full communion with the See of S Peter, I have been worried by how often I have been asked whether Mass done in such-and-such a way is or is not 'valid'. The traditional teaching of the Church is very clear here. It is extremely difficult for a priest to render his Mass 'invalid'. If he is validly ordained; if he uses real bread and real wine; if he uses words which clearly reference the Lord's utterances "This is my Body", "This is my Blood", and if he intends to 'do what the Church does', his Mass is valid. His way of celebrating may be profoundly unedifying; but the Mass is not essentially about edification. It is the Lord's Sacrifice. 'If he intends to do what the Church does'! So ... you ask .... can a heretical priest be said to 'intend to do what the Church does'? You may well ask. I will, Deo volente, deal with this tomorrow. Meanwhile, I shall not accept comments. And, by the way, this post is NOT an attack on the SSPX. A few days ago, we moved house. Readers who had my old address, telephone number, and email address will, if they wish to email me at the email address they have, be sent my new (geographical) address and telephone number (if we have not frequently been in touch, remind me ...) We are still within the all-important 15-minutes-by-bus-into-Oxford-and-four-buses-an-hour zone. Personal news: You may know that I broke my shoulder very badly last November ... coming down the steps of S Peter's after visiting the Sacristy to book an altar for the following day. A kind priest friend looked after me and saw me safely home, where I had an operation a couple of days later. I can now be certain of setting off the alarms in any and every airport security scanner. The surgeon said the maximum I could hope for was 80% recovery, and I think I have that. The arm is fully functional but can get sore if I am imprudent. This hasn't stopped me having wonderful times getting around: some of the highlights have been Copenhagen, Dublin, the first singing in the Birmingham Oratory of the Latin hymn to Bl John Henry Newman, which the Oratory very kindly commissioned from me.